“Buy the one you want” is a catchphrase often quoted at the yearling sales and repeated over and over again. This is exactly what the team at Dynamic Syndications did at the 2019 Inglis Australian Easter Yearling Sales when we struck early, before the market had time to settle into its rhythm. Champion Race Mare FICTIONAL ACCOUNT (IRE) boasting a wonderful international pedigree. He is currently the sire of winners of more than $20 million for this 2018-19 Racing Season with 142 Winners including 11 Stakes Winners. Overall he is the sire of over 720 Winners including 89 Stakes Winners (12.3%), 76 Stakes Placegetters including 13 Gr1 Winners and over $135 million in earnings. Snitzel’s top fillies include: ESTIJAAB, SWEET IDEA, SNITZERLAND, CHANCE BYE, FLYING SNITZEL, FRENCH EMOTION, PERIGNON, I AM EXCITED, SNITTY KITTY, etc., etc. Dynamic Syndications have had success with the SNITZEL breed with stakes winning horses ARBEITSAM ($1,129,600) and DANCES ON STARS ($768,710). 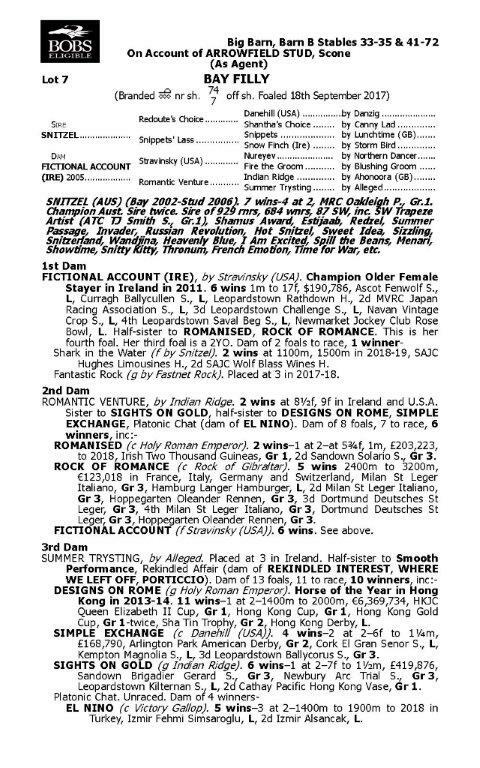 Our filly is a daughter of 2011 Champion Irish Mare FICTIONAL ACCOUNT (IRE) (by Stravinsky). She won 6 races with 5 placings and was awarded Champion Older Female Stayer in Ireland in 2011 before coming to race in Australia where she was also runner-up in the Japan Racing Association Stakes LR at Moonee Valley before retiring to stud. A High Quality mare she started 13 occasions in Stakes Races. 28 Starts: 6 Wins, 2 Seconds, 3 Thirds, 2 Fourths and earnings of $190,429. Champion Older Female Stayer in Ireland in 2011. 6 wins from 1m to 17f, £24,316, €82,232, A$22,300, Ascot Fenwolf S., LR, Curragh Ballycullen S., LR, Leopardstown Rathdown H., 2d MVRC Japan Racing Association S., LR, 3d Leopardstown Challenge S., LR, Navan Vintage Crop S., LR, 4th Leopardstown Saval Beg S., LR, Newmarket Jockey Club Rose Bowl, LR. 2014 g. Fantastic Rock, by Fastnet Rock. Placed at 3 in 2017-18. 2015 f. Shark in the Water, by Snitzel. 2 wins at 1100m, 1500m in 2018-19, SAJC Hughes Limousines H., 2d SAJC Wolf Blass Wines H.
2016 f. Unnamed, by Snitzel. 2yo. 2017 f. Unnamed, by Snitzel. Our Filly. Our Filly is bred on the exact same SNITZEL x STRAVINSKY Cross as Brilliant dual Gr1 Winning Racehorse RUSSIAN REVOLUTION the winner of the Oakleigh Plate and the Galaxy – he retired to the serving barn as SNITZEL’S Fastest Son to go to Stud. Offered by Arrowfield Stud, our newest addition to the Dynamic Syndications team is closely related the 2013-14 Hong Kong Horse Of The Year DESIGNS ON ROME. This filly was conceived under the terms of a FOAL SHARE and was offered for unreserved sale as per the terms of Foal Share Agreements. We had valued this filly highly, based upon an excellent commercial pedigree, outstanding genetic success, excellent residual value, quality conformation, clean x-rays and a clean endoscopic report. However with the added advantage of being aware that the filly was a foal share and contractually having to be sold in the salering, we were convinced this filly could slip through the net and represent outstanding value. When the hammer fell for $150,000 + GST we were truly astounded at the sensational value we had secured for a high quality filly. The service fee for Snitzel is $220,000 and here we have secured a fabulous filly, clean on x-ray and scope, by Australia’s Champion Sire, from a Champion Irish Mare who also raced with distinction in Australia and she’s closely related to a Champion Racehorse in Hong Kong, for just 75% of the current SNITZEL Service Fee! That’s what can happen with foal shares at auction and why we always endeavour to locate foal share yearlings at the sales. 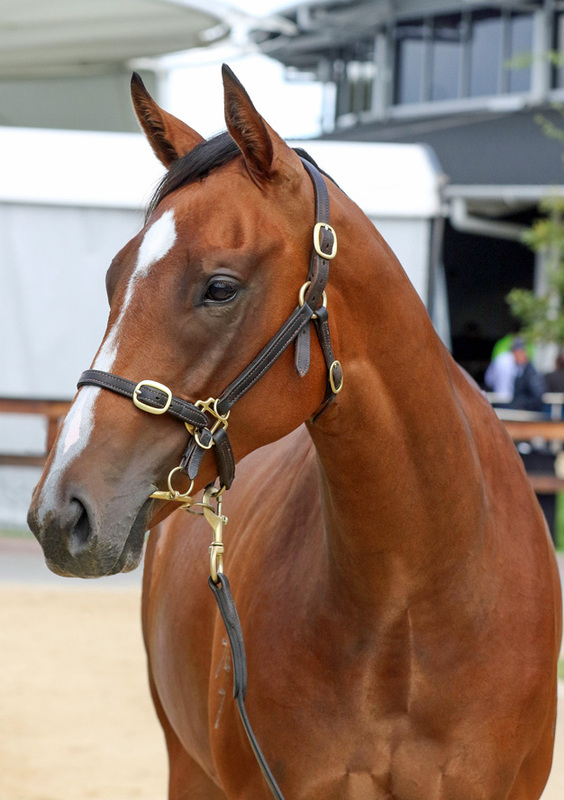 Later in the day, after 200 Lots having gone through the sale ring and with one hour left in the sale on Day 1, Snitzel has had a colt sell for $2.8 million and another for $1.1million and a filly sell for $1 million. Gross $8,335,000, Top Price $2,800,000, Average $641,154, Median $400,000. This is compared against the total Sale Average of $381,022 and a Sale Median of $280,000. 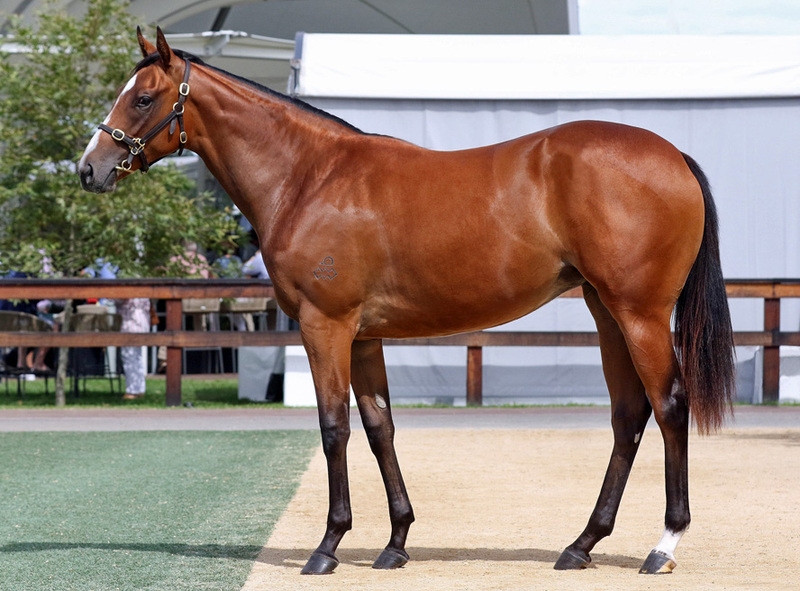 Arrowfield Stud, the vendor and one of the two parties to the Foal Share, acknowledged that they believed that she was a “steal” and advised that they would be happy to “Buy-Back” a 10% equity in this filly to race in co-ownership with the Dynamic Syndications team. Naturally we were delighted to hear their confidence and have happily welcomed them to the team. At this early stage, a trainer hasn’t been allocated and documents will need to be submitted to Racing NSW for approval before a price per share is determined. 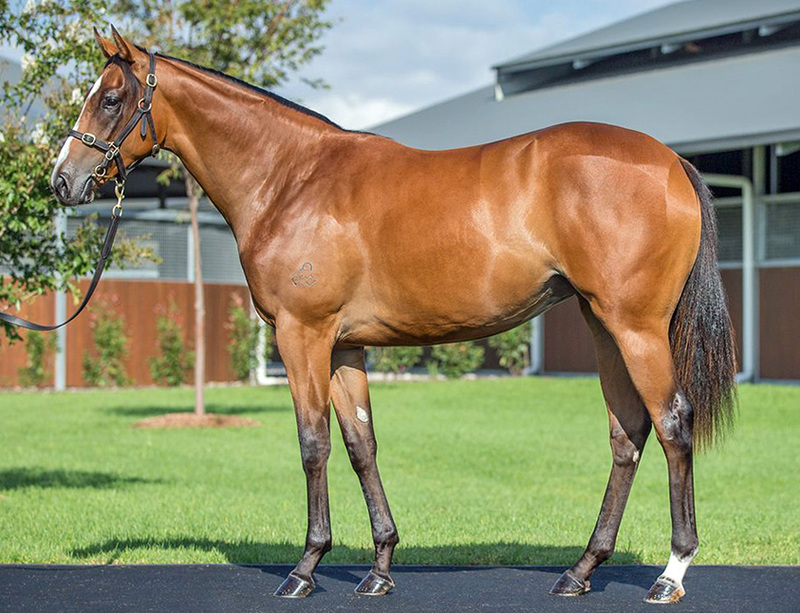 However if this fabulous filly sparks your interest don’t delay giving Adam Watt at Dynamic Syndications a call on 02 9540 1511 or 0409 464 378 and have a chat with the view of being one of the first to hear about the filly when the time comes to release her into the market.